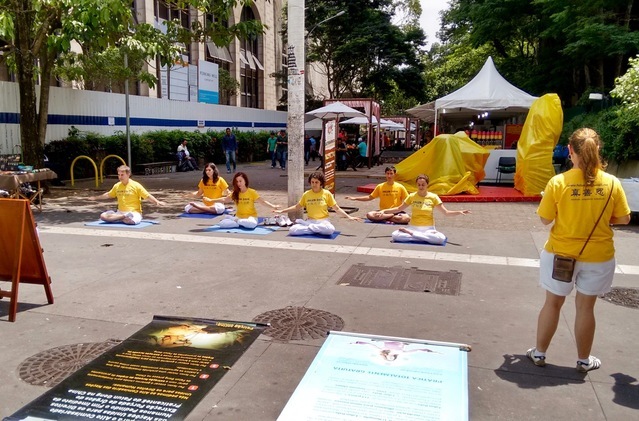 For about four years, Falun Dafa practitioners have gathered once a month on Paulista Avenue, the busiest in Sao Paulo, Brazil, to raise awareness of Falun Gong and the ongoing persecution of the meditation practice in China. The practitioners set up informational displays in Portuguese and Chinese. They handed out flyers to passersby, telling them about the Chinese communist regime's brutal persecution of Falun Dafa, as well as improvements in health people have experienced after practicing Falun Gong. Practitioners also demonstrated the five tranquil Falun Gong exercises and collected petition signatures on behalf of Doctors Against Forced Organ Harvesting (DAFOH), calling to end the Chinese regime's killing of Falun Dafa practitioners imprisoned for their belief and harvesting their organs for profit.